Visit the Sacred City of Rocamadour, the hotspot for pilgrimages en-route to Saint Jacques de Compostelle. Located just 15 minutes from the campsite, the town of Rocamadour is one of the most beautiful villages of the Lot. It is home to exceptional sites and monuments, which you must discover during your holidays in the Lot. The town of Rocamadour is located between Lacave and Padirac, in the heart of the Regional Natural Park of Causses du Quercy. Make the most of your holiday in mobile homes comfortable, close to the medieval city of Rocamadour. We also offer campsites for the most adventurous. 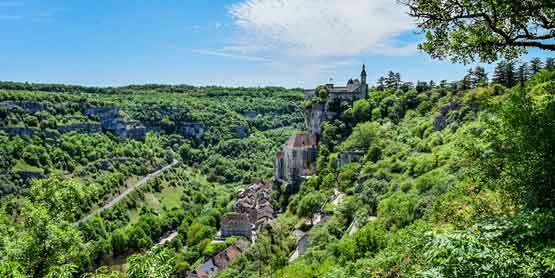 Postcard landscape Lot, Rocamadour is a small village perched on the limestone cliffs of the Lot. You will take the Grand Staircase to access the Religious City. You will not be able to miss Notre-Dame Chapel, its Statue of the Black Madonna and the Basilica of St. Savior. You will understand, our campsite in the Lot will allow you to quickly and easily access Rocamadour, one of the most beautiful villages in France, located in the Lot. Note that in September the Montgonlfiades will take place. You will observe on two days the departure of balloons from the canyon of Alzou. Located on the side of the cliff, the Medieval City is a breathtaking site. His superimpositions of houses beaten on successive levels. The Religious City overlooks the stream Alzou 150 meters higher. You will get there by taking the Porte du Figuier which leads to the rue de la Couronnerie. Then you will climb the 233 steps of the Grand Staircase to reach the Black Virgin so venerated by the pilgrims who stop there during their pilgrimage to Santiago de Compostela. You arrive on the front of the churches, which includes 8 churches and chapels: the Basilica of St. Savior, the chapel of St. John the Baptist, St. Blaise, Our Lady, St. Michael, St. Anne, St. Louis, and the crypt St Amadour. Clinging on the cliff, Rocamadour la Vertigineuse impresses with its height and the superposition of buildings: “The houses on the brook, the churches on the houses, the rocks on the churches, the castle on the rocks”. Take the 216 steps to arrive at the church forecourt and discover the 7 sanctuaries.